A novel one-step process that combines thermoplastics and reaction injection molded polyurethane in a two-cavity tool was demonstrated in a live operation for the first time outside Europe at NPE2012 in Orlando, FL last week. EX Series, the process targets medical applications requiring cost-effective production of a soft, chemical resistant surface on a stiff substrate, such as polycarbonate. The ultra-low volatile organic compound process eliminates painting and the associated overspray common to traditional in-mold painting. It targets applications ranging from high-end cases for electronic devices to arm rests for seating. 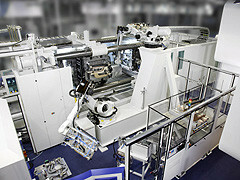 Paul Caprio, managing director of the American unit of KraussMaffei, told Plastics Today in an interview at NPE2012 that KraussMaffei is using a 50,000 square foot facility adjacent to Proper Group International’s headquarters in Warren, MI to assemble and test systems for the process, as well as other systems. polyurethane technology in the US market, providing turnkey systems. At the NPE, a new, foamed aliphatic polyurethane system was used that combines excellent UV resistance and soft-touch properties. The CX Hybrid injection molding machine combined the advantages of the hydraulic and electric machine design for a broad range of applications. Combined with the electrically driven injection units of the EX series, the machines offers high power density at low energy consumption with parallel movements and injection speeds of up to 300 mm/s.